Abstract: Passive topical administration of nucleic acid drugs and vaccines is a desirable goal for patient-friendly manipulation of target cells in the skin. However, two major delivery challenges that have impeded topical nucleic acid development are 1) penetrating the stratum corneum, and 2) avoiding endosomal entrapment and degradation. GeneSegues has developed a novel non-viral drug delivery technology, sub-50 nanometer (s50) crystallized capsules, for intact delivery of nucleic acids to intracellular sites in target cells. s50 capsules are directed to specific tissue and cells by formulating appropriate targeting proteins, peptides or antibody ligands as the crystallized capsule shell. 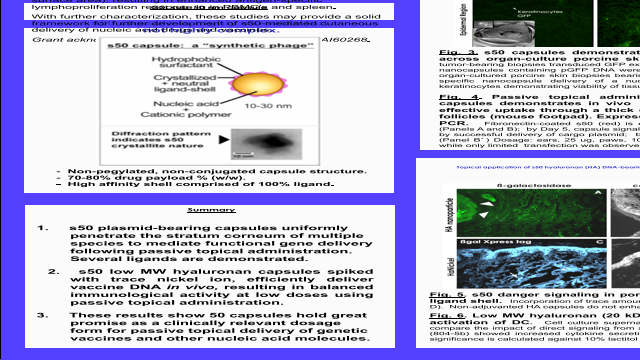 The novel size and structure of s50 capsules allows for efficient penetration of the stratum corneum and, by co-opting the non-endosomal pathway referred to as lipid rafts, intact delivery of nucleic acid cargo to the nucleus and cytoplasm of the target cell. Here we show in pilot studies using pig dermis organ culture as an established and relevant model for human skin, transcutaneous passage of plasmid-bearing s50 capsules with cell-specific targeting. In these studies, we compared fibronectin, hyaluronan and tenascin as shell targeting components. We then extended these studies of passive cutaneous delivery, using plasmid-bearing, fibronectin-coated s50 capsules, to in vivo timecourse studies in murine paws where stratum corneum layers in footpads are approximately 50 μm thick, demonstrating uniform transfection of underlying basal keratinocytes. In a further extension, using hyaluronan-coated s50 capsules together with a novel adjuvant, we demonstrate a functional response to model antigen in studies of passive topical DNA vaccine administration in weanling pigs. Skin is a powerful immune organ, not conveniently addressed by current methods of vaccine administration, e.g., injection, gene gun, or electroporation. We found improvement in mucosal and cell-mediated immune responses, relative to intradermal protein antigen injection that was biased towards distal and draining nodal lymphoctyes, demonstrating a functional response in a clinically relevant model to topical administration of nucleic acids using s50 capsules. We then executed a follow on study with this capsule design in rabbits, using a higher dosage (by surface area), resulting in enhanced antigen-specific lymphoproliferation response in in PBMC’s and spleen. With further characterization, these studies may provide a solid framework for further development of s50-mediated cutaneous delivery of nucleic acid drugs and vaccines. Grant acknowledgments: NIH R43 CA119556, R43 AI60268.